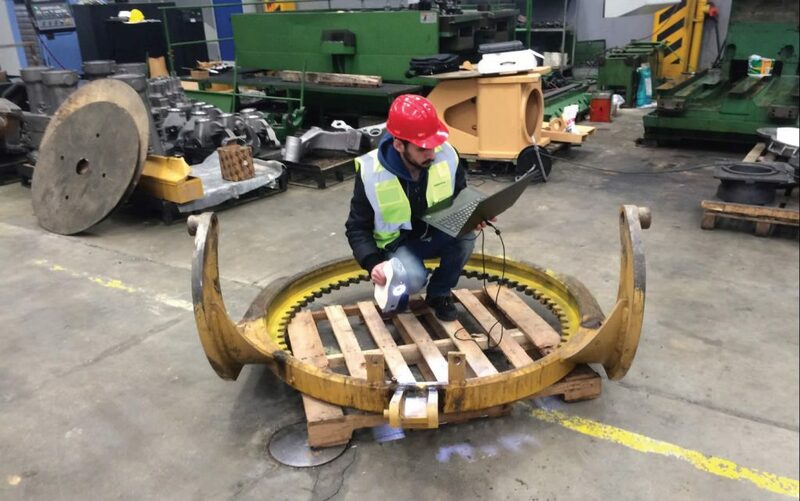 Artec’s Gold Partner in Turkey Teknodizayn has successfully completed a project for replacing old parts of a construction machine with new ones, milled from 3D models that were made with Artec Eva, a high-precision portable 3D scanner for large objects. The job was commissioned by Assan ASP, a well-known international manufacturer and distributor of construction machine spare parts. Normally it would take Assan ASP a couple of weeks to measure and draw these parts, and some of the elements were quite difficult to measure accurately with traditional methods. 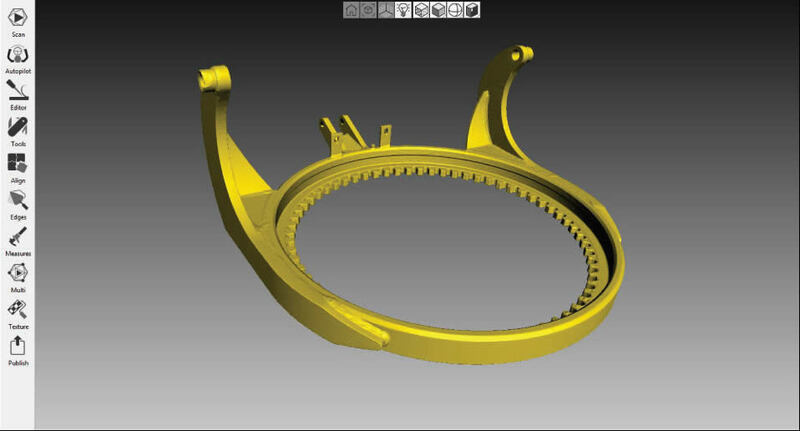 After a demonstration by Teknodizayn, Assan ASP managers saw that it is significantly easier and much faster to work with Artec 3D scanning solutions and Geomagic reverse engineering software on cases like this. The task was to duplicate two independent parts of a construction machine (drawbar & yoke assembly and circle assembly) for future use. The parts needed to be accurately manufactured from the data obtained during 3D scanning and then fitted to the same type of construction machine. “As we know, Artec 3D scanners are the best to use in situations where there is a big part that needs to be scanned in a location where conditions are difficult. This was exactly this kind of situation,” says Ali Can Boysan, Sales & Technical Support Manager at Teknodizayn. Ali had to scan on the premises of the manufacturing facility, wearing special safety equipment. He used the Artec Eva scanner along with the Artec battery pack as there was no immediate access to the mains power supply. Each part took 30-40 minutes to scan in detail (including the top and bottom areas). “Those were very fast scan sessions,” says Ali. Once he was done with the scanning, Ali transferred the data to his computer at the Teknodizayn office. Post-processing each part in Artec Studio 3D imaging software took around 4-5 hours. There were numerous scans from different angles on both top and bottom sides of the parts, which added up to a large amount of data. The data was processed manually. First the unnecessary parts of the scans were erased, and then the scans were aligned using the quick and simple point to point alignment algorithm. Then Global Registration with Texture and Geometry was applied, which resulted in a dense and accurate point cloud that needed to be meshed. The next step was Sharp Fusion with the best possible resolution, creating .stl mesh models ready for reverse engineering. The manufactured parts achieved the exact precision required. They were installed and tested on a working construction machine, proving to fit very well. Assan ASP were impressed with the results and bought an Artec Eva, Space Spider and Geomagic for SOLIDWORKS CAD bundle to improve their traditional workflow and use the technology in future R&D. The parts were able to be 3D scanned on the premises of the manufacturing facility using the Artec Eva 3D scanner along with the Artec battery pack as there was no immediate access to the mains power supply. The manufactured parts achieved the exact precision required. They were installed and tested on a working construction machine, proving to fit very well. Assan ASP were impressed with the results and bought an Artec Eva, Space Spider and Geomagic for SOLIDWORKS CAD bundle to improve their traditional workflow and use the technology in future R&D.